I met Mr. Aquila at the Conservatives4Palin meet-up the evening before the Restoring America Tea Party Rally in September in Iowa. Frank Aquila is the former chairman of Senator John McCain’s 2008 Presidential campaign committee for San Joaquin County in Northern California. His book details his role in lobbying for Sarah Palin’s acceptance on the Republican ticket in the Vice Presidential slot. The book also covers a good deal more, in that he lays out the way in which the media was guilty of a form of malpractice not only in their spiteful coverage of Sarah Palin, but also in their absolute failure to vet Barack Obama. More, he highlights the ways in which the McCain campaign itself undercut the Vice Presidential candidate. He goes to significant lengths to explain the philosophical underpinnings of the socialist left, and he finishes the book with his own prescription for the country. It’s a story told from the perspective of a grass-roots activist who has seen the way party politics operates, and it’s well worth the read. (You can read an excerpt here). In detailing his e-mail exchanges with party higher-ups shows the process by which Senator McCain went about the process of listening to advice through the campaign structure. It also reveals just how persuasive may have been the writings of blogger Josh Painter, with whom most of my readers are familiar. This insight helps the reader to understand some of the considerations that may well have been in play at the time, and why John McCain ultimately selected Sarah Palin to be his running mate. Mr. Aquila goes on to relate how he had his start in grass roots politics, and explained some of the nitty-gritty details of local level party politics, and just how thoroughly trying it can be among the competing egos and interests. At one point, he explains with what seems a sense of wonderment that for no apparent reason, as the President of the South San Joaquin Republicans, suddenly, his endorsement meant something. This sort of endearing confession is part of what makes the book well worth the read: Here was a humble, ordinary fellow, who came to find his opinion had gathered some weight with those in his community, and his description indicates he’d never considered the implications. Frank’s case demonstrates that ordinary people can still have an extraordinary impact in America. Aquila then launches into an explanation of his view of the 2008 campaign, exploring the depths of depravity to which the media has fallen, and the complete lack of objectivity in journalism that now prevails in most American newsrooms. One of the things that becomes clear in his re-telling of events is something many of his readers, and certainly readers of this blog will remember from the 2008 campaign: In many respects, you have the sense that the 2008 campaign consisted of a battle of Barack Obama vs. Sarah Palin, and that it was the media deference to the former and their open warfare against the latter that characterized the media’s coverage of the respective campaigns. Aquila demonstrates the rampant hypocrisy in the media by a stunning side-by-side comparison of the coverage. This refreshing of memories of the events of the 2008 campaign season helps to remind the reader why the country is in so much trouble now, only three years later. Aquila then covers the struggle between statism and liberty through a lengthy chapter on the roots, history, and current state of the communists, socialists, and other assorted totalitarians who wish to convert the US into some sort of slave-pit. Readers of this blog will be familiar with some of this information, but in truth, much of what Aquila covers cannot be retold frequently enough. He rightly explains that while the Cold War ended, the left’s designs on America never have. The last chapter in the book presents Aquila’s own vision for the country in the form of Ten Solutions for Restoration of America. I won’t give too much away, but I think it’s clear that his passion for the founding principles of the country and his commitment to them informed his list of solutions, and I think they’re a great starting place for the national discussion our nation must have if it is to survive. This chapter serves as both a warning and a reproach: Address these fundamental issues or lose the country, and we have it in each of us to begin this mighty chore. 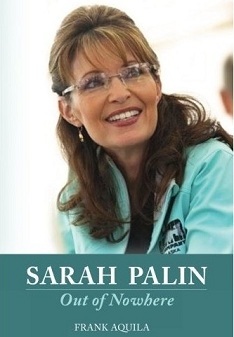 Sarah Palin – Out of Nowhere is a book you should move to the top of your reading list. Aquila has done a fantastic job of putting together a book that is sure to inform his readers, not only about the process that constitutes American politics on the grass-roots level, along with the details of the 2008 campaign, but also exemplifies the passion for this country that still typifies the conservative movement in America. While cautioning his readers about the tough battle ahead, his up-beat outlook reminds the reader that so long as we fight for it, this is still America. You can pick up a copy on Amazon.